This Frank M. Tyler, Jr.-designed residence is a two-story, Gothic and Tudor revival with an irregular-plan, stucco and wood finish, and wood trim. Its side gable roof, slider, bay, and diamond-in-quad decorative windows are part of the design. The entry is recessed and off-center. Additional character-defining elements of the structure include: many front and rear gables and dormers of various pitch and design, occasionally paired; flared and decorated bargeboards; various types of decorated bracketwork often scrolled; extended rafter tails; rustic shingle; clapboard siding; triangle brackets below eaves; porte-cochere with beadboard ceiling; half timbering; flagstone base. Other Frank M. Tyler, Jr.-designed City of Los Angeles Historic-Cultural Monuments include No. 417: the Gordon L. McDonough HOUSE, No. 467: the Chalet Apartments, No. 599; the Julius Bierlich Residence, and No. 678: the Thomas Furlong House. The original owner-occupants of this home were William Otterbein Statton, Anna Jane Sylvester Statton, and two of their children, Ernie S. Statton and George Fairfield Statton. William O. Statton moved to Los Angeles in 1911 as president of the Pierce-Kennedy Brokerage Co., an investment consortium of financiers that had coal and timber interests in the Southeastern U.S. The Pierce-Kennedy Company itself simultaneously made the move west from its prior East Coast home. Statton was a prominent Colorado banker and financier. He served as the Rio Grande County Treasurer from 1896-1902 and owned a lumber business and a hardware store. In addition, Statton was a director of the Pyramid Investment Company, still-operating California oil & gas exploration company that was established circa 1909 and traded on the Denver Stock Exchange. After relocating to Los Angeles, Statton purchased the 1415 South Gramercy house directly from Daniel T. Althouse. It was customary for the Althouse Brothers firm to prepare designs and began construction of their self-financed mansions, and then customize the still-under-construction edifices for their wealthy clients. Unfortunately, this owner would not enjoy his house for long. In November 1913, at the age of 49, William O. Statton died suddenly. His widow, Anna, and sons continued to live at the mansion for several years. The second owner-occupants of this home were Col. Henry A. Frambach and his family. Frambach built his family’s fortune through manufacturing and banking interests in Wisconsin and Michigan before moving to Los Angeles and becoming the proprietor of one of this city’s elegant apartment hotels, the Ansonia in the Westlake District. He is credited with helping create the Fox River Valley’s modern papermaking industry, introducing technology in the 1870s that is still in use today, and receiving three patents for these manufacturing processes. 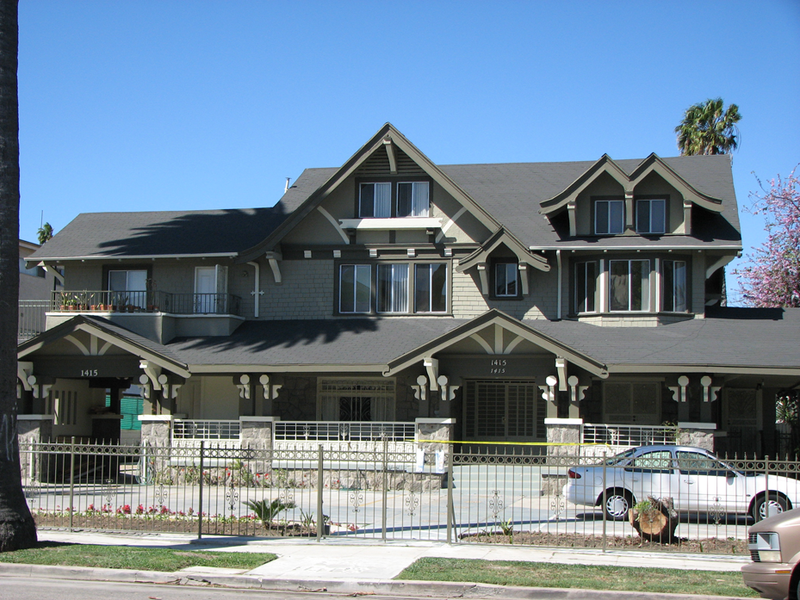 The Statton residence appears to meet the criteria of the Ordinance as a site of particular importance in the architectural and social history of the West Adams community. It embodies the distinguishing characteristics of an architectural-type specimen, particularly its use of Gothic Revival elements with Tudor Revival decoration. Few examples of this early style remain. In addition, the residence exhibits originality in combining Tudor Revival steep cross gabling and HALF TIMBERING to create a strong medieval feeling. It is valuable as a study of a period revival style and notable for its use of paired slender pointed gables with decorative bargeboards and elaborated and original bracket work.